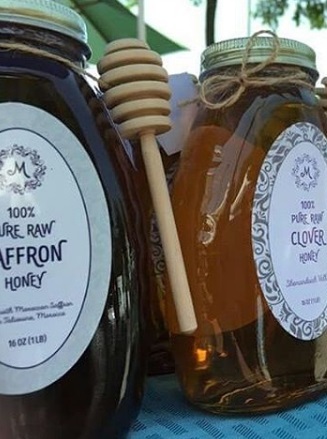 Moroccan Saffron, LLC offers a selection of high quality, gourmet food products handcrafted from the finest ingredients found both locally and around the world. Come join us at Eastern Market every weekend! Taste our raw local honey and smell the delightful aroma of our pure Moroccan saffron, handcrafted artisan tea blends, finishing salt collection and more. We have been selling at Eastern Market since 2015. We Specialize in the Saffron Trade. Our saffron is hand-picked from the saffron fields of Taliouine, Morocco and brought to your kitchen. Taliouine is the heart of Morocco’s saffron industry. It is a mountain village situated near the Atlas Mountains. The rich volcanic soil combined with the ideal climate—dry, with brutally hot summers and cold winters—gives the saffron its potency, color and exceptional aroma. Centuries of developing agricultural skills has allowed farmers to produce some of the world’s finest saffron threads. We promote sustainable agriculture by sourcing our saffron directly from Moroccan farmers, which ensures they retain 100% of the profit. Taliouine is the top saffron producer in Africa, and Morocco is the fourth-largest producer of saffron in the world. Our goal is to offer the freshest, most aromatic, top quality food products. Most of the ingredients found in our products are organically sourced. We sell pure saffron that is superior in quality. Our honeys are locally produced in the Virginia Shenandoah Valley and are naturally, deliciously, silky sweet. Our artisan teas are handcrafted from the finest ingredients found around the world. We created a collection of aromatic finishing salts that will enhance any dish and appease any foodie. Please give our products a try! You will not be disappointed.